HOUSTON--(BUSINESS WIRE)--Apr. 10, 2019-- Halliburton Company (NYSE:HAL) is pleased to announce the City of Houston declared Wednesday, April 10, 2019, as Halliburton Day in honor of the Company’s 100 years of growth, innovation, and unparalleled customer service. 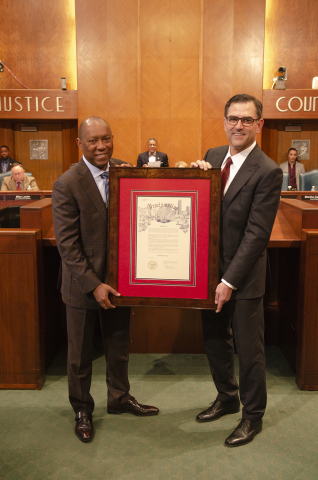 Houston Mayor Sylvester Turner presented Halliburton Chairman, President and Chief Executive Officer Jeff Miller with a City of Houston Proclamation at a ceremony held at City Hall in the Council Chambers. The proclamation recognizes Halliburton for its economic impact to the city and the Company’s more than $26 million in contributions to Houston non-profit organizations since the Company opened its Houston headquarters in 2002. Founded in 1919, Halliburton celebrates its 100 years of service as one of the world's largest providers of products and services to the energy industry. With 60,000 employees, representing 140 nationalities in more than 80 countries, the company helps its customers maximize value throughout the lifecycle of the reservoir — from locating hydrocarbons and managing geological data, to drilling and formation evaluation, well construction and completion, and optimizing production throughout the life of the asset. Visit the company’s website at www.halliburton.com. Connect with Halliburton on Facebook, Twitter, LinkedIn, Instagram and YouTube.